BayWash Tunnel Clean Technology means that the i5 Soft-Touch Hybrid In-Bay Automatic Car Wash must deliver the same level of cleaning performance as our touch-free equipment — only with brushes. Anything less and your car wash won't be able to deliver a consistent wash day in and day out, and customers won't come back week after week. It starts with the i5's 5-brush wash system with swinging wrap coupler that provides complete coverage of every vehicle surface. A 2-step presoak process leverages the same technique used by conveyorized operators to promote water break, improve drying efficiency, and lubricate wash material for safety. The i5's standard vehicle profiling means that every customer from the largest SUV to the smallest subcompact will leave satisfied, planning their next visit. If you're looking to compete for and create loyal customers, you'll appreciate the attention to extra service options available with your i5. 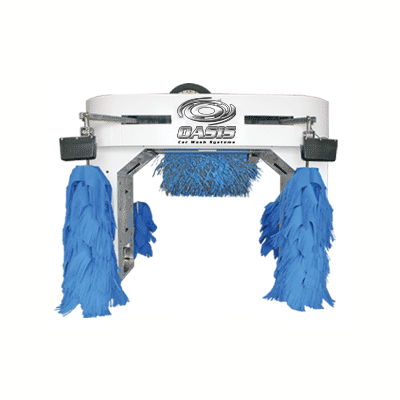 Cleaning wheels demands a separate application of full-strength cleaner and prolonged contact from specialized high-pressure blasters and both are available on your i5 wash system. Triple-foam, Total-Body Protectant, and even online Tire-Shine are just a few of the extra services you can provide your customers with the BayWash i5. The i5 Soft-Touch is fully supported through our BayNet system. If something ever goes wrong, you won't be on your own looking for a solution. The i5 will perform a diagnostic to alert you and your service provider with specific information on the nature of the problem. BayWash has access to a fully stocked warehouse, and typically ships parts the same day. If you have a local technician, he or she may even be able to repair your system immediately thanks to the i5's open architecture and use of standardized parts.